That there was an obvious gap in quality between the two sides cannot be ignored. There were times when the defensive shape and system of the Romanian side was nothing short of disgraceful. At the same time there was little by way of fluency or discernible mechanisms in their attempts to counter the English side. Structurally the Romanians were content to leave players in high positions looking to stretch the defensive block of City in transition. Their accuracy of direct vertical passes in to these wide areas however was poor. The team sheet and basic positioning of the Manchester City players did not come as much of a surprise for any observers. The only changes for the opening league match against Sunderland came in the full-back positions with Bacary Sagna and Gael Clichy both dropping down to the bench to make way for Pablo Zabaleta and Nicholas Otamendi. The latter moved in to the centre of defence with Serbian defender Alexsandr Kolarov moving back out to his more familiar left back role. For the second match in a row now Guardiola has effectively used David Silva and Kevin De Bruyne as deeper lying creative players. Both are generally more comfortable in the ‘10’ space but they are operating in transition more in the midfield strata and then pushing forward as a double attacking pivot as City press forwards and enter an established attacking phase. These central movements were made possible by Guardiola employing two traditional wingers in the wide areas. Nolito and Raheem Sterling held their wide positions well and forced the defensive block for Steaua to stretch horizontally. This simple mechanism creates pockets of space for the central midfielders to advance forward. As for Steaua they lined up in a relatively straightforward 4-2-3-1 base system with pace provided on the flanks by the dangerous Popa and the Algerian international Jugurtha Hamroun. The true danger player however was Romanian international Nicolai Stanciu who started from the ‘10’ position but had the licence to move in to pockets of space in or between the lines as they presented themselves. As the match evolved however Steaua found themselves on the defensive from a very early stage, to the point that they were unable to counter attack effectively anyway. At the weekend after the match against Sunderland the British media lost their minds. Much was made about the tactical revolution that saw Guardiola deploying Bacary Sagna and Gael Clichy as ‘false full-backs’. This essentially saw the two wide defenders move centrally when in possession to flank Fernandinho in the defensive midfield strata. This tactical concept however was of course nothing new. Guardiola had used this to great effect during his time in Germany with Bayern Munich and Phillip Lahm and David Alaba and effectively come to define the role with their performances. To this point however the City full-backs have looked anything but comfortable in this more tactically disciplined role. That may be the reason why Guardiola chose to completely change his full-backs for this match. Aleksandr Kolarov on the left hand side certainly offers a more attacking and forward thinking option than Gael Clichy. 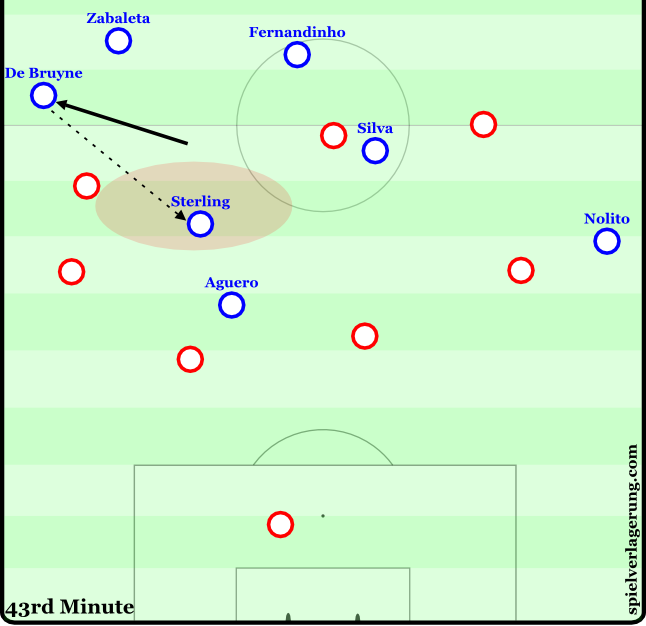 In this match however the movements of the two full-backs varied depending on the positioning of the players in front of them and the location of the ball in relation to their area. 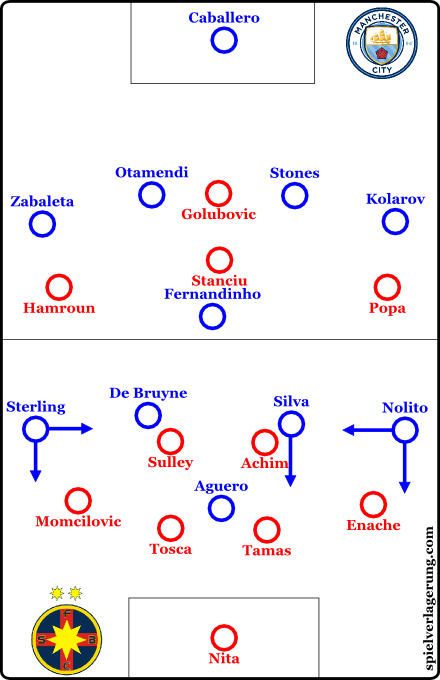 On the left hand side Kolarov certainly took the opportunity to step in field, not only to the defensive midfield strata but all the way up the left half space to connect and link with Silva, Nolito and Aguero. Whether the half space would be open for Kolarov however depended largely on the position that Nolito had taken up during the attack. During the opening stages the Spanish winger took up the wide position and held it to allow David Silva to drift in to space inside. As the match progressed though Nolito started to cut infield looking to connect with Aguero himself and the space became too crowded for Kolarov to advance in the half space. On the right hand side the setup was slightly different. Zabaleta spent more time in the opening exchanges in what could be described as a ‘traditional’ full-back space. He was wide and relatively deep preferring to allow De Bruyne and Sterling to link ahead of him and keeping a close eye on the threat of a potential counter attack by the quick Hamroun. As the game progressed though and Steaua proved to pose less of a threat as City had thought we started to see Zabaleta move infield in to central zones more often. The Argentinian full-back was still more tactically disciplined than Kolarov on the left and he tended to form a central connection with Fernandinho more as opposed to pushing forwards. Two 8’s or two 10’s? In both of the first two matches of this season we have seen David Silva and Kevin De Bruyne line up as a central midfield pairing. As we stated earlier we were seeing two players who were used to playing as central attacking midfielders starting in a deeper central role. To this point though the thinking behind the role and positioning of the two creative players seems to be to build a double pivot of sorts in the final third. This pivot allows City to circulate possession across the pitch quickly and efficiently as a means of pulling the oppositions defensive block out of position. Combined with the wide positions taken up by Sterling and Nolito (or Kolarov) this cycling of possession horizontally and vertically creates passing lanes through and around the oppositions defensive block. These spaces can then be attacked by either Sergio Aguero in the lone striker role or by the far sided wide player moving in to provide support and overload centrally. David Silva appears to have acclimatised to the role extremely quickly which is no surprise given his tactical and technical intelligence. De Bruyne on the other hand seems to be slowed to adapt. He did have some nice moments when switching out to wide areas to empty the central spaces and allow Sterling to attack inside. For all the positives (let’s not forget that City won the match 5-0) there was still evidence of the team trying to adjust to Guardiola’s game model, specifically when building up from the goalkeeper. Much has been made in the media this week of Guardiola’s decision to drop English international goalkeeper Joe Hart from the starting lineup and replace him with the Argentinian Willy Caballero. The general consensus is that Caballero is better with his feet and therefore is a better fit in the game model that Guardiola wants to implement. Steaua however were unwilling to allow City to build up from the back and progress from the first to the second third of the pitch without pressure. The Romanians had pace in the wide areas where Popa and Hamroun moved up. Fernandinho was attempting to drop centrally with the two centre backs splitting wide. Even this passing lane and option was pressured centrally. This led to Caballero on occasion looking to bypass the initial press to hit De Bruyne and Silva directly in the second third of the pitch. These forced movements served only to further highlight that Guardiola may look to re enter the transfer market for a goalkeeper who is more accurate with the ball at his feet. It is still too early to draw any meaningful conclusions from this game. Some of the movement and interplay in the final third and around the Steaua box was reminiscent of Bayern and Barca under Guardiola. There were still however pronounced issues with the initial build up and with the understanding of positioning and movement in the middle of the pitch as City progressed the ball. An easy win then against mediocre opposition that allowed City to play as they wanted and where they wanted. There will certainly be tougher matches to come in this competition for City but for Guardiola and the implementation of his game model this was probably the perfect game against the perfect opponent. I think Guardiola might need some good players to translate his philosophy as for example the full backs he had in Bayern way better than the ones he has at city. Thank you for your analysis! keep it going!